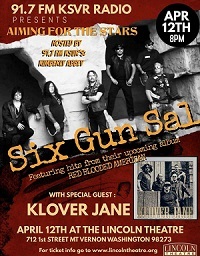 Los Angeles based southern rock band Six Gun Sal will move you with melodic emotional ballads, and grungy rocked out powerhouse songs, featuring powerful lead guitars and funky bass riffs, and drum fills. With a large international social media fan base and the favorite of many top name musical artists, Six Gun Sal is quickly rising to the top of the performing music industry. You’re want to see these guys live!! Advance Reserved Seating Tickets: $40 VIP: $27 1st section; $22 2nd Section; $16.50 3rd Section + applicable fees. VIP ticket includes premium seating, an After Party, with an acoustic set by Klover Jane, and autographs and selfies with the bands.